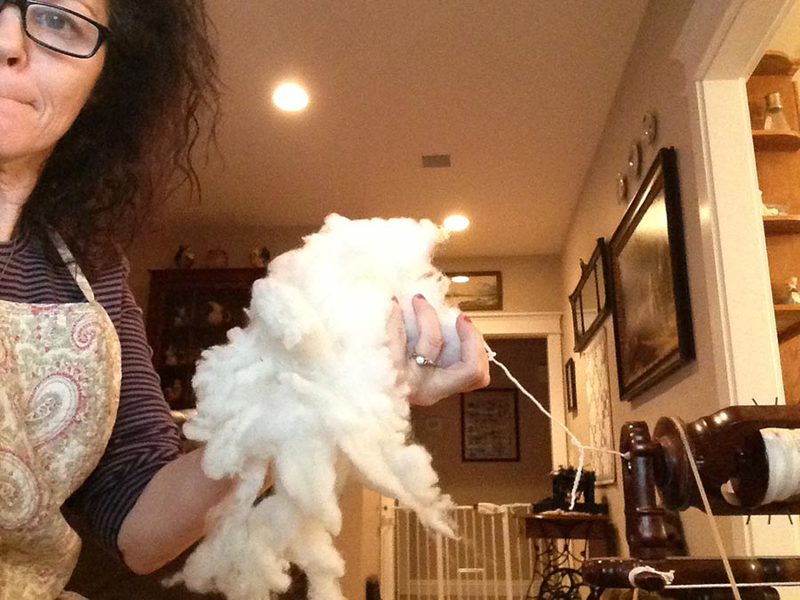 On today's guest post, Sharon Tree shares a typical day on her own fiber farm with our readers. If you've ever wondered what it's like to raise fiber-producing animals, today's post will give you a peek inside (and outside) the barn! 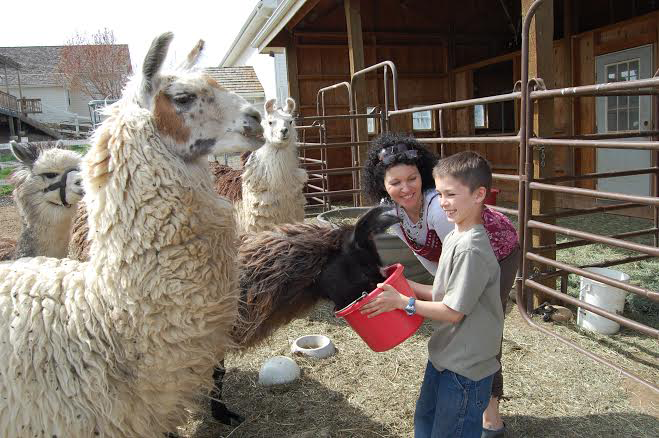 On my fiber farm, I raise sheep, llamas, alpacas, goats and Angora rabbits for fiber. Each day begins by checking on the animals to make sure that no one is caught in the fence or needs to have their coats adjusted. 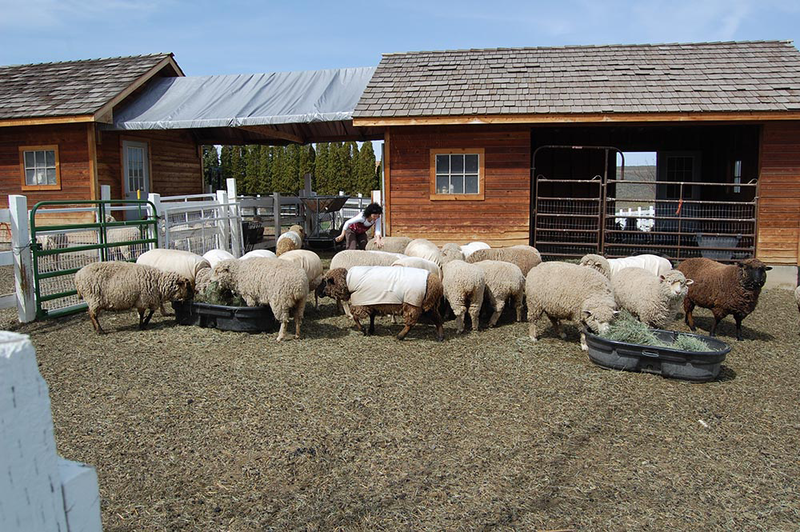 Many fiber farmers will jacket their sheep (and other animals) to keep the fiber clean and protected from the outside elements; un-jacketed sheep can get into quite a few messes! If an animal is moving slowly, that means it's time to corral the herd and check for pale eyelids. This in an indicator which means that worming medicine must be administered by injection, a process which is quite time-consuming. After that, it's time for breakfast, which is either grain or hay from the barn. While the sheep eat, I dump over the troughs and clean them out, then check the waterers in the pasture to remove any debris which may have fallen in since the day before. Occasionally, it's necessary to empty the waterers out completely in order to scrub out algae that has formed - clean water is always a must! 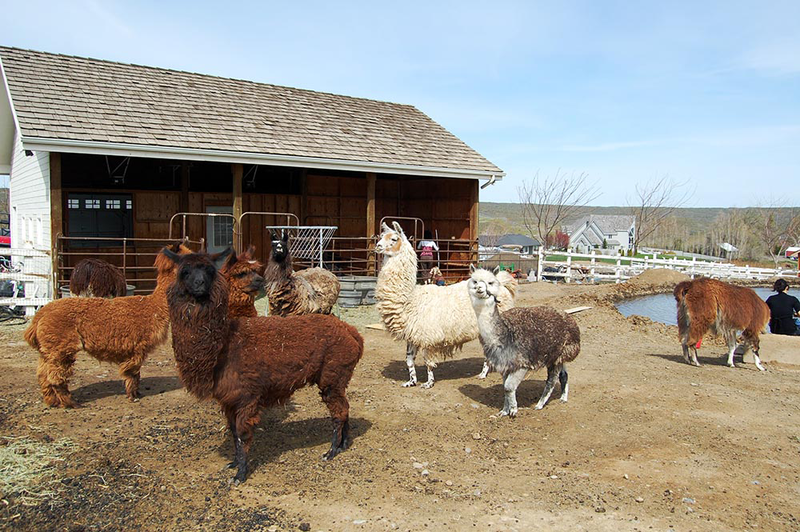 A typical morning of checking and feeding animals and cleaning their surroundings begins with the ewes, followed by the rams, llamas, goats and alpacas. After that, it's time to check on the chickens to collect eggs and clean their waterer. The next stop is to check on the angora rabbits to make sure they are fed and have plenty of water. Each bunny is checked for mats, mites and weight. 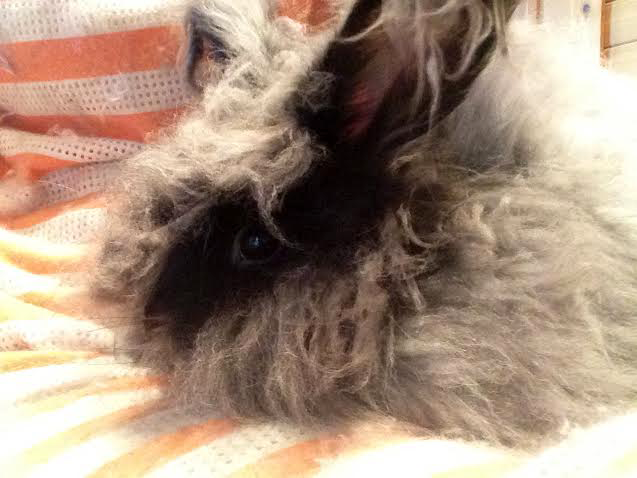 If they are plump, I know that they are eating well; if a bunny has matted hair or longer fiber, that means it's time for a shearing! If I have a request for a purchase of washed wool, I will then pick the fleece and start a soak. 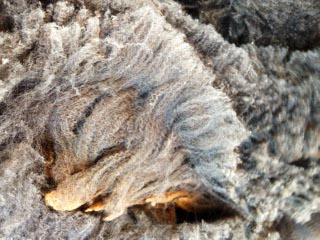 While washing the fleece can be time-consuming (one fleece typically takes four hours), I have found that it is much more cost-effective to wash your own wool rather than having others do it for you. The soaking time can be spent spinning or tending to other tasks such as feeding the dogs and barn cats, the studio guinea pig, or doing some gardening or house work. Barns are cleaned on an as-needed basis, but I make a point to clean them before lambing, during labor (which can last two hours) and every day after the last lamb is born so that each stall is fresh and clean. Lambing goes on for at least two months in the spring, but it it worth it to spend the extra time cleaning during those two months, as it keeps the lambs and ewes much healthier. Once the lambs are born, it's necessary to check on them several times each day to make sure their tummies are full. 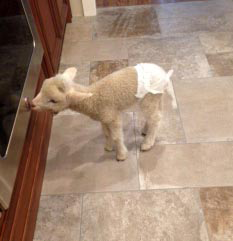 If one doesn't seem to be thriving, I will milk mom and give the lamb at various times throughout the day; if the lamb is not nursing at all, it gets to wear a diaper and live in the house where's it's bottle fed and easier to keep an eye on its progress. Once it's good and strong, it will start getting into trouble, which means it's ready to join the rest of the lambs outside! My flock is cormo sheep, a breed I chose for its fine fleece and hardy nature - cormo sheep are known for having very few health issues in general. 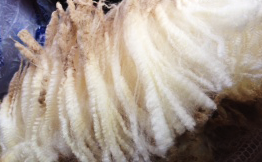 Each year, I cross some of my white cormos with a colored ram or a BFL ram to introduce variety and color into some of the fleeces. Not only does it provide new genetics when needed for a proven ewe, it's also a bit like playing Dr. Frankenstein, as you're never totally sure what you'll get! Life on the fiber farm is always filled with surprises and ups and downs. It's a thrill to welcome new animals to the world, and sad when we lose one to old age or illness (luckily for us, the latter happens infrequently). It's a true pleasure to share the fibers we raise with fiber-loving folk, and nothing beats being able to spin with fiber we have collected from these wonderful animals who bring us so much joy each day! Sharon Tree is a passionate fiber farmer who designs yarns & patterns and judges and sells fleeces. She is also a teacher and share many spinning tutorials here on her YouTube channel.